mommy's reviews: Ritz Crackerfuls...A Taste Of Summer! Summertime is the perfect time for so many outdoor activities. Boating, fishing, swimming, biking, hiking, camping, picnics, reunions, etc. There are certainly a lot of ways to keep ourselves and our families busy. :) In case you didn't notice, most of those activities I listed involve some sort of eating. Food has and always will be a vital part of get-togethers, parties and activities. If you aren't eating when you are having fun...you just might want to see if you are really having as much fun as you could be having! LOL!!! Ritz Crackerfuls give consumers a fresh look at eating crackers and cheese. Not only are these tasty morsels multi-grain, they are also filled with delectable cheese fillings. Now, I am not talking about a small cracker here...these crackers are about three inches in length and for one of these snacks, you would double that because there are two crackers sandwiched together! These Ritz Crackerfuls are unlike the traditional Ritz Crackers. Here in our house, we thrive on Ritz Crackers. We usually purchase them in big boxes with multiple sleeves. If hubby even suspects that we are getting low, he will buy another huge box. :) That shows you how much we love them. Well, for this review I was sent three boxes of Ritz Crackerfuls to try and they are pretty amazing! I was sent Sharp Cheddar, Garden Vegetable and Garlic Herb. One of the first thing that I loved was the fact that they are all individually wrapped. This is great so you don't have to worry about the whole box going stale on you. The first flavor that I tried was the Garlic Herb. These were very yummy! The cheesy filling has just the right amount of garlic and it wasn't overpowering at all. The Garden Vegetable is probably my favorite flavor. I have always loved Garden Vegetable Cream Cheese so this was a perfect flavor for me. There are 3 other flavors that I am anxious to try and those flavors are: Four Cheese, Classic Cheddar and Cheddar Cheese & Bacon. Want something to smile about? Check out the new Cheese it Up app from Crackerfuls. It allows you to turn any awesomely bad photo into one that’s just really awesome. Don’t be left out, go to www.facebook.com/ritzcrackers and click on the CRACKERFULS tab to share a little wholesome fun, and give someone you know something to smile about. Oh yes, and these yummy crackers only cost about $3.50/box. Not bad considering you are getting a fiber-filled cheesy snack that will satisfy your cravings in a heartbeat! Disclaimer: I received no monetary compensation for this post. I did receive Ritz Crackerfuls for review purposes. All quotes and stock photos are from the Kraft/Nabisco/PR website and email. All thoughts and opinions are 100% mine. Oh I love that these are whole grain! I will have to keep my eyes open for these. I'm always looking for tasty whole grain snacks for myself and the kids. Thanks for sharing! I'll definitely check these out - thanks for the review! These sound really tasty! I love that they're on multigrain crackers! We've tried these before and loved them! My son absolutely LOVES these things! Honestly, my only complaint is that the box is so small he could eat them in one sitting! I think there needs to be a mega size box available! 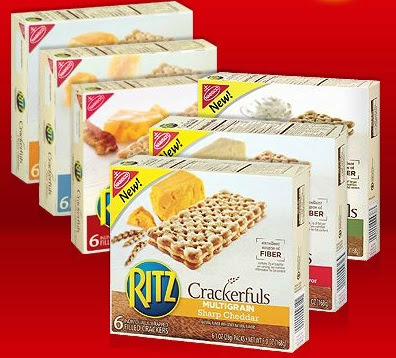 Oh fun - I used to love Ritz, and would be in to trying these new whole grain ones! These look really good, especially the garden vegetable! !